Before the name of Hans Englyst became a name to conjure with, he was one among many nutritionists and chemists working in the United Kingdom on the problem of dietary fibre. In the 1980’s, this was a hot topic. But in 1982, Englyst and his collaborators noticed something rather queer: when they attempted to digest some starchy foods using an enzyme extract from the pig pancreas, a good surrogate for the human, broadly speaking, a small fraction consistently remained undigested. Puzzled and suspecting the influence of operator error, they repeated the experiments. The same results came up: 1 – 2 % of starch in some foods, 3 – 8 % in others, with all other factors being equal, were not digested under conditions simulating normal, physiological digestion of foods in the human. The fact that the proportion of undigested starch increased in some foods after cooking and storing at refrigeration temperatures, most notably potatoes, and remained relatively static in others, such as tapioca, opened up interesting lines of inquiry that have impacted the field of nutrition study to this day. Englyst would soon uncover the nature of the undigested starch fraction and codify the method that now bears his name for the analysis thereof in a small paper quietly published in a supplemental issue of the American Journal of Clinical Nutrition that would go on to become one of the most cited papers in the field as later researchers would appropriate his methods and definitions, in whole or in part. Englyst described the undigested starch fraction as “resistant” starch (RS) – that is, resistant to physiological digestion under normal conditions in healthy humans – and described three distinct causes of this “resistance” to the peptic enzymes. Additional types would later be added. Never content to let a good and saleable opportunity go to waste, the food industry would fund numerous studies on the promising material in the following years. In my own opinion, having been intimately associated with this research for some years, it appears that not a few of the putative benefits assigned to RS were ascribed post-hoc, but that is also a topic for another time, another post. Here, we are concerned mainly with facts and definitions. There are indeed two definitions of note when discussing the present matter. RS is most accurately defined as “the fraction of starch that is passed, undigested, through the small intestine of healthy humans”. This functional, physiological definition is quite independent of any single chemical or physical characteristic and may be considered as a subset of dietary fibre (DF), which is most currently defined as any carbohydrate fraction that survives digestion in the small intestine of healthy humans. Both RS and DF are passed from the ileal terminus into the colon, where they may be either utilized as a substrate for energy production by the gut microflora or simply excreted, with various factors weighting one of the two possibilities more heavily than the other. 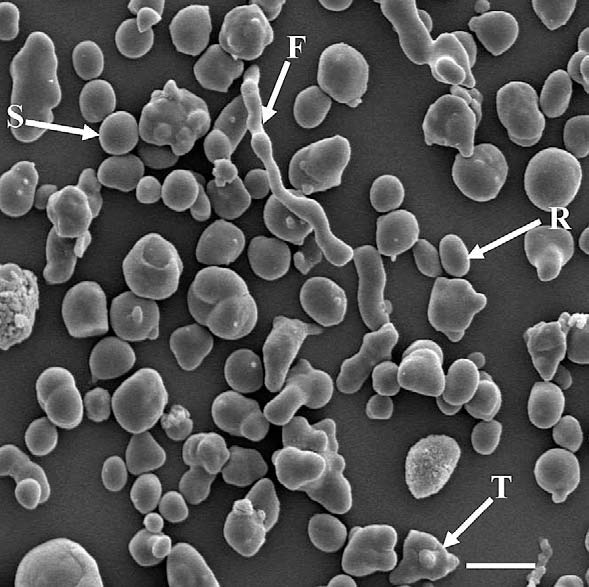 Just as there are a number of starch granule structures and arrangements of the glucose polymer components, there exist a number of causes that may promote a “resistant” characteristic to a starchy food. The classic definition by Englyst allows for three “types”, or causes, of resistant starch, with two later addenda. RS Type 1 (RS1) is most usually defined as starch in a matrix inaccessible to digestive enzymes. The principle is actually quite easy to demonstrate: the chalky center of poorly-cooked long-grain rice, the toothsome center of an oat groat, the starchy center of a lentil encapsulated by the seed coat – all of these are inaccessible to the pancreatic enzymes released into the chyme and to the brush-border enzymes in the small intestine, which is the key aspect of this type of enzyme “resistance”. RS1 appears to be mainly excreted and is thus poorly utilized by the colonic microflora. Possible sources of RS1, depending on cooking time and conditions. The distinction of RS Type 2 (RS2) as raw, resistant granular starch against the physically inaccessible starch of RS1 may not be immediately apparent. However, RS2 is distinct in that it is the superstructure of the starch granule itself that renders the starch resistant to the action of enzymes. While various theories have been proposed for why this should be so, the basic fact remains that the B-type starches, particularly those of tuberous origin, tend to resist human digestion than those of cereal origin. The starch in wheat flour (A-type), for example, is digested to a much more thorough extent in the small intestine than, say, that of potato (B-type) or some green bananas (C-type). Some authors do draw a distinction between RS2 formed by starches with a normal (20 – 30 %) range of amylose as a proportion of starchy material (RS2a) and those that are thermally stable due to the presence of high-to-very-high proportions of amylose (50 – 70 %, or even higher in some barley strains, RS2b), although this convention is not universally accepted. 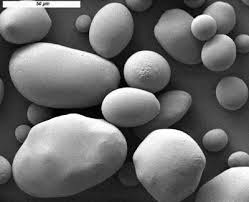 Scanning electron micrographs of potato starch (A, RS2a) and high-amylose maize starch (70% amylose, B, RS2b). RS Type 3 (RS3) is the last of the RS types originally identified by Englyst and is of a notably different character. It is most casually defined as indigestible double-helices of amylose and longer amylopectin side-chains that the pancreatic α-amylases cannot cleave by hydrolysis. 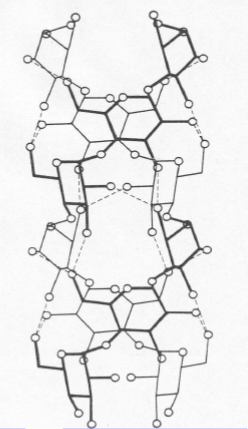 These chains are of crystalline character and have a helical pitch that renders them unsuitable to the binding-site cleft of many α-amylases. Most importantly, these types of double-helices are formed by the mobile chains of cooked starchy materials as they seek for an energetic minimum, and as such the content of RS3 in certain foods, again I bring up potato as my example, is higher than others after cooking and refrigeration. Commercial preparations of RS3 (e.g. Ingredion’s Novelose 330®) are sometimes formed by repeated heating and cooling cycles of high-amylose starch sources, particularly high-amylose maize. Furthermore, it is my opinion that RS3 is the most physiologically relevant form of RS and not improbably that best utilized by the colonic microflora. In future posts, I will hopefully demonstrate this based on the literature. Double-helical retrograded starch chains (RS3), showing H-bonding interactions. Beyond the classical definitions of RS (if such a term can be applied to such a relatively young phenomenon), the first to be “identified” was RS Type 4 (RS4), or any number of the chemically modified starches produced by the food industry. While some naturally occurring chemical modifications of starch do occur (such as the monophosphate esters in potato starch – and yet again I turn to potatoes! ), the sorts of modifications that consign a starch into this category are not those normally encountered anywhere in nature’s long memory. Such examples include cross-linked starch, octenyl succinic starch (something of a recent research fad), acetylated starch, and numerous others to introduce some desired functionality into starch. Occasionally, these are deemed safe enough for human consumption to be marketed for human consumption (e.g. ADM’s FibersymTM and FibeRiteTM cross-linked wheat starches) at moderate degrees of substitution (DS), or for non-food use if heavily substituted (e.g. highly cross-linked starch used as latex glove powder). My future posts will address modified starches, including those modified specifically to impart enzyme resistance, in more detail. 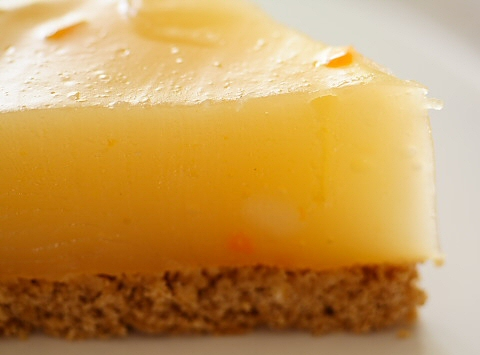 A common food starch application of phosphate cross-linked starch (RS4), pie filling. RS Type 5 (RS5) was the most lately identified and industrially produced “resistant” starch and is most similar in character to RS3. RS5 is, broadly speaking, the helical complex of amylose chains with the aliphatic moiety of a fatty acid, triglyceride, or other, mostly hydrophobic amphiphile. Such complexes are present in whole foods, such as grains (notably wheat and oats), legumes (such as chickpeas), and notably are mostly absent in tubers. However, most of the literature on “RS5” has originated from the laboratory in which I did most of my studies and speaks specifically of an industrially-produced modified starch made by partially cooking high-amylose maize starch, removing most of the exterior amylopectin branch-chains with the enzyme isoamylase, and adding a long-chain saturated fatty acid like palmitic (C16:0) or stearic (C18:0) acid under controlled conditions. This results in an intact, granular starch that has a coating of lipid that does not exhibit normal “gelatinization” behaviour on heating. Now, to this point, I realize that these posts have been nothing but a background info-dump. I apologize for the arcane nature of them, but a firm grounding of the nature of starch and its characteristics is necessary for the material that will be covered in future posts. For example, although the benefits of resistant starch have been much extolled by academia, which is neatly in the pocket of industry, and more recently by certain health bloggers, I myself have reservations. The broad category of materials to which we might apply the label RS cannot, in my opinion, be considered universally beneficial, and certain biomarkers that are used in the study of resistant starches are likely to be misleading due to how the research in this field has been driven by special interests. My next post will address the putative benefits that have been assigned to resistant starches and an issue of which that the food science community has remained blissfully, or willfully, unaware for more than a hundred years.